Dental implants are the most common type of teeth replacement especially when there is no hope left to salvage the teeth. Usually patients who come to us for a consultation require more than one or two teeth to be replaced and have lost their teeth because of some reasons. Accidents or Traumatic experiences that may have caused teeth loss. Gum Disease, where teeth have become wobbly in the jaw bone because they’ve lost support. This is usually the result of the patient having avoided the dentist for years because multiple reasons like financial issues, or even a fear of visiting the dentist. Infection in the Jaw bone. One of the most common reasons why people need dental implants, Nerve infection can happen in the jaw bone, mainly due to bacterial caries that happen over the years as the teeth of a patient rot. Patients who require implant dentistry usually fall into two categories. They either have other teeth that are in good condition or can be restored with fillings or crowns and then need replacement of not more than three teeth in different areas of the jaw. These patients usually require single tooth implants or multiple teeth implant with teeth that are joined together and are supported on these implants in the form of a bridge. The dental implants are then usually placed in the jaw with the help of adequate planning from 3D X-rays and scans of the jaw where the exact placement of the implant is determined before the surgery. This is also known as guided surgery or 3D implant dentistry, where the implant is placed exactly where the dentist wants it to be, which makes the surgery straightforward, atraumatic and completely predictable. With the help of advanced scans, we are able to plan the entire procedure before use the drill to place the implant. The implant is made of titanium and is completely sterile and the procedure is done with aseptic draping and sterility. 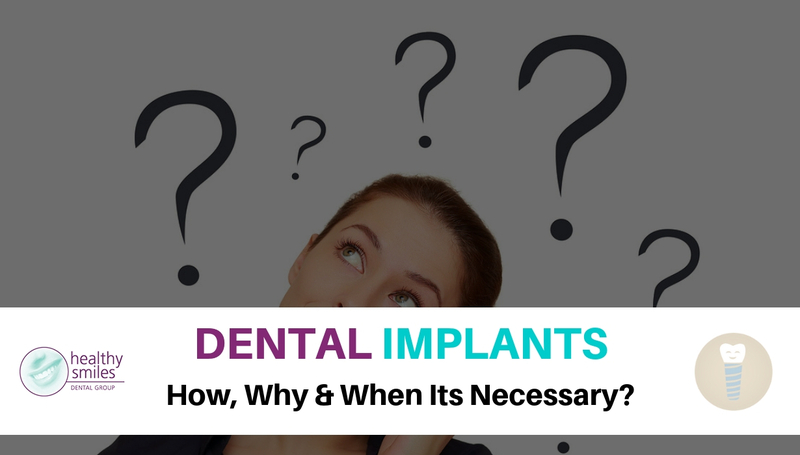 If done adequately, implants usually last for a very long period of time. This is because once they integrate with the bone, they are part of your body and the crown can be attached to the implant and can serve as a normal tooth for you to chew on. The second type of common implant dentistry we do is called all-on-four or all-on-six dental implants. This is where most of the teeth in a particular arch or jaw of the mouth are missing and these teeth need to be replaced by multiple implants. With the help of experience and that of using adequate implant procedures and high-end dental laboratories, we are now able to produce teeth in one to two days for most of our patients. This requires complete replacement of all teeth or four or six implants. These patients usually require a full set of diagnostics, 3D scans and impressions before any surgeries are committed to. All of this planning is done based on the future smile of the patient with the help of software and computer-generated images. Once all of the records are in place, the patient is usually booked in under general anesthetics, where we are in complete control of the surgery. Most of the badly broken down or infected teeth are then removed in the same appointment and the new implants are placed with the help of a Graflex procedure. These new implants go on to become the support system of the teeth in the future. With the help of experience, most of the impressions and the work is done under general anesthetic and the laboratory commences the construction of a temporary set of teeth even before the patient wakes up. Once the patient is in recovery, some try-in appointments are done while the patient is still at the surgery and their new teeth are then delivered within one to two days. This can be life changing for some patients as this could give them the confidence they needed about dentists. It should be noted that while these teeth are not permanent, a new set of teeth based on titanium will then be constructed roughly three months from the start of the procedure. These will become the permanent implant prosthesis for the patient. Now That We’ve Answered The Why Behind Dental Implants, Let’s Move on to The How. Before starting any major dental treatment, including implant dentistry, a through comprehensive check-up has to be conducted to help us determine the suitability of the patient for dental implants. This includes an examination of the soft tissues as well as the hard tissues in the jaw with photographs, impressions and 3D scans. Once all of this data is collected, the dentist can evaluate the condition of the patient and their suitability for dental implants. What follows is an honest discussion with the patient about the pros, cons and risks of different implant procedures. A treatment plan is then formulated for the patient, including a complete list of item numbers that the patients can then take to their insurance to work out with regards to eligibility for major dental treatments and implant rebates. The treatment plan also has an accompanying information sheet, which goes through all of the frequently asked questions that the patients would like to have answers to before they start their treatment. This will help inform the patient about the procedures and clear any doubts they might have, thus developing the informed patient consent. The cost of the dental implant procedure usually is one of the main concerns for patients when electing whether to go ahead with the procedure or not. Depending on the kind of implants that need to fit and their number, the cost of this procedure can vary between 4 to 6 thousand dollars for a single tooth replacement, all the way up to 25 or 30 thousand dollars for all on 4 dental implants or all-on-six implants procedures. To know more about the cost of this procedure, please ring us on 98772035 or visit our website. You can also ring us to make a free consultation appointment. A variety of dental payments are accepted here at Healthy Smiles, ranging from EFTPOS to Patient finance plans, which help patients spread treatment costs over a 36-month-period, based on eligibility and applications. « How to Overcome the Fear of a Dentist?